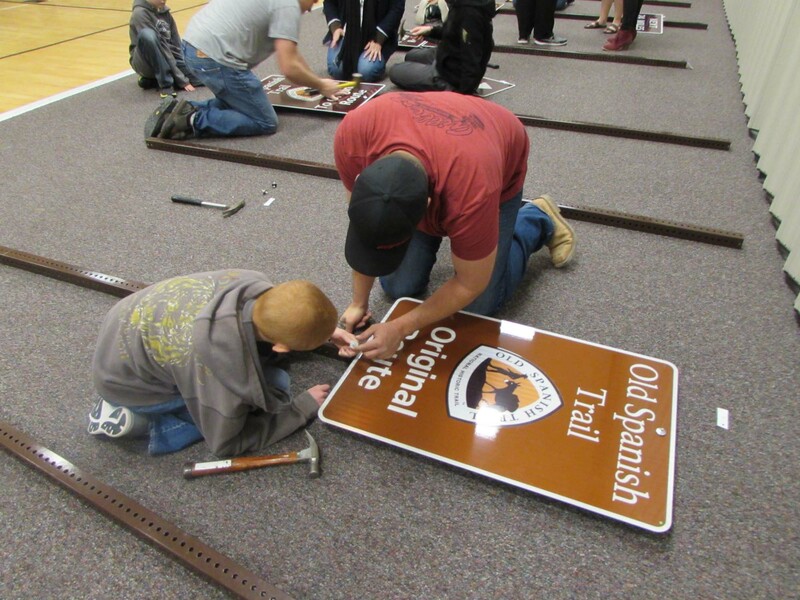 PAROWAN – A ceremony in Parowan Wednesday will mark the installation of the last of 85 new signs along 80 miles of the Old Spanish National Historic Trail. The event will celebrate Iron County’s legacy of treasured Old Spanish Trail history and is scheduled for 4 p.m. in the Parowan Library. The route is the longest signed segment of the trail and is an effort by 12 partners that spanned two years. “Iron County has a special place in the history of the Old Spanish Trail, primarily because segments of the trail can still be identified and located by ground and aerial survey,” Al Matheson, Utah director of the Old Spanish Trail Association, said in a press release. The Bureau of Land Management and Iron County paid for the signs and posts respectively, with half of the funds coming from a Waypoint Grant from the state of Utah. The sign bases were installed by the Iron County Road Department, and the signs were installed in a series of three Eagle Scout projects led by Barrick Perkins, Mason Paxton and Jayden Paxton, all of Enoch, Utah. “The partnerships that brought this project together will keep alive the mule pack trains that kept trade flowing through Utah, New Mexico, Colorado, Nevada, Arizona and California,” BLM Cedar City acting field manager Keith Rigtrup said. Other partners include Sun Edison, Clenera Solar, Parowan City, Enoch City, the town of Paragonah, Utah Department of Transportation, the National Parks Service, the U.S. Forest Service and the Old Spanish Trail Association. “We are excited to have the Old Spanish Trail identified and marked where the public can learn about an almost forgotten era in Iron County’s history,” Mike Worthern, Iron County natural resource management specialist, said. Congress designated the Old Spanish Trail in 2002 to recognize the significance of the notoriously arduous trail that traders used to transport goods between Santa Fe, New Mexico, and Los Angeles, California, between 1829 to 1848. The trail passes through New Mexico, Colorado, Arizona, Utah and Nevada, including parts of Washington, Iron, Garfield, Piute and Sevier counties. What: Ceremony in celebration of 85 new signs on the Old Spanish Trail. When: Wednesday, Feb. 22, at 4 p.m.
Where: Parowan Library, 16 S. Main St., Parowan. For more information about the ceremony, contact BLM Cedar City outdoor recreation planner Dave Jacobson 435-865-3000.